Did you know that spiders shed their skin? Much like a snake sheds it's skin? It's true, they do! Sure, I had to Google it to find out for sure, but now I know, and so do you! Oh, did you want to know WHY I Googled it to find out? Because I found this in the basement. That is the exoskeleton thingy of a Wolf Spider. Just so you can see the actual size of this ginormous arachnid, I got my hand as close as I dared, THAT is how dedicated I am to all of you and your thirst for knowledge. 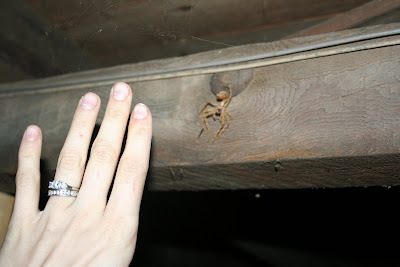 And yes, you may think it is not really all that daring to get your hand close to the shedded skin of a spider, but just the knowledge that the owner of said skin may still be lurking in my basement was enough to make me want to run out of the basement squealing. Does anyone else feel a little bit itchy now? Ick. That's kinda creepy. I'm not a big fan of spiders. Ugh...ugh...ugh...I completely have the heebie jeebies now!!! That's just plain scary...and that thing could still be alive and in your house somewhere. No No NO!!! I so couldn't deal with that. You're a stronger woman than I to have even gotten that close! Well done you! I actually like spiders so don't think they are creepy... However, if it had been a wasp, you would have heard me screaming! You are so brave!! I could not put my hand that close! That is an interesting fact, I would have never known. I have never minded small spiders, but for some reason spiders that size and bigger creep me out..... Oh well. 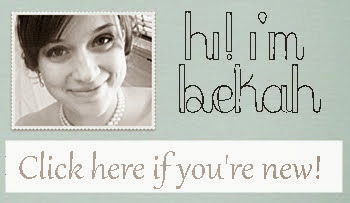 Left something for you on my blog that, hopefully, is much more pleasant than that monster! I got the heeby jeebies just looking at the photo. Somewhere in the last few days I saw a photograph of deep fried spiders. Huge honkin' gigantic spiders. I am very, very fearful of huge honkin' giant spiders, even deep fried, and costing $6 each. But I still felt sorry for the poor things. You should see the wolf spiders in Texas. They are ginormous! Way to be brave for the readers! 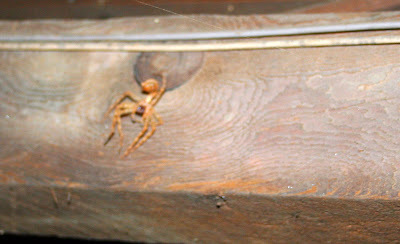 I will admit to you that I *ALMOST* did not read this post just becuz of the nasty spider pic. I literally start to breathe all heavy and sweat and sometimes cry when I see a spider. I would have taken one look at that wolf spider (skin or not) and screamed my bloody head off and run, NEVER MIND put my dang HAND near it! You are very brave....I wouldn't want to get that close....eeew ! !